There is yet another example of the mythology of Michael Moore growing with the complicity of the media. Time's article by S. James Snyder, “Michael Moore: 'I'm Mainstream Now' ” read like another example of an incurious journalist who bought into Moore's PR and joined in with some covert activism. For the past month or so, finding bias in an article about Michael Moore has been about as easy as it is to find "creative editing" in Moore's films, and this article was no exception. Moore dismissed the controversy surround his visit to Cuba with a group of 9/11 responders seeking medical treatment, documented in his new film. He said he had not intended to go to Cuba in the first place. "I didn't go to Cuba. We left Miami to go to Guantanamo Bay — to American soil." Only after being ignored at the mouth of Guantanamo Bay did he instead dock and disembark on Cuban soil. Since then, he says, he has been harassed by the U.S. government. "The Bush Administration sent me a certified letter 10 days before the Cannes Film Festival that I was under investigation for criminal and civil penalties," Moore said. That's just fantasy. Other sources have revealed that Moore planned to go to Cuba from the beginning. The Smoking Gun website obtained a letter to Moore from the Office of Foreign Assets Control (OFAC) which stated that before filming even began, Goldflat Productions, which included Moore, applied to OFAC on October 12, 2006 for permission to travel to Cuba—not “to American soil” at Gitmo, but Castro's Cuba. Responders were told Cuban doctors had developed new techniques for treating lung cancer and other respiratory illness, and that health care in the communist country was free, according to those offered the two-week February trip. Sounds like visiting Cuba was planned beforehand to me, but I'm confused. 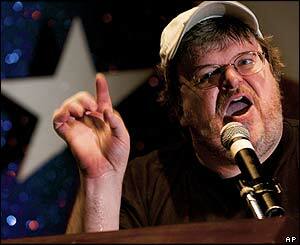 Michael Moore wouldn't try to deceive people would he? Compare this flattering and unquestioning review with the more honest and critical USA Today review which actually delved into Moore's typical deceptive filming practices and flawed claims that I blogged about at Newsbusters. Too bad that this Time review just seemed to be part of the Michael Moore, Inc. and the Lions Gate “Sicko” corporate PR machine, which would, of course, by Moore's standards, be evil.